Feedback we often get from our clients is that they don’t have the time to vet through each and every agency in detail. That results in picking a bad apple every once in a while. It’s dealing with those bad apples that takes up most of your time; inefficient communication, incomplete reporting, goals only half met, payment issues. It’s a marketing agency’s job to take work off your plate. Not to add up to it. 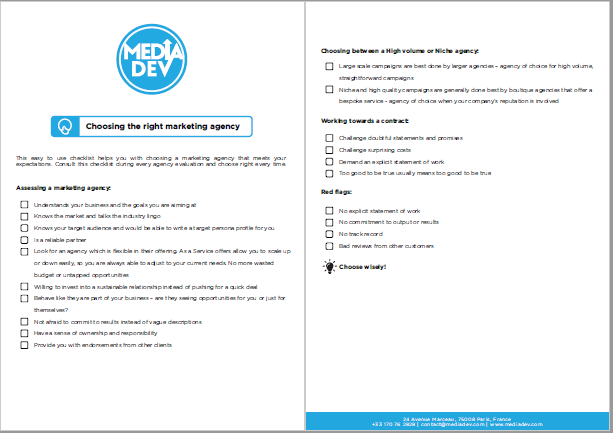 This free and easy to use checklist helps you with choosing a marketing agency that meets your expectations. Consult this checklist during every agency evaluation and choose right every time.